Congratulations! You win 31 bonus points with this purchase! These prescription colored lenses were optically correct, comfortable and provided good vision. They are not over colored, which is what I required, indeed they merely enhanced my natural grey blue eyes accentuating the grey. I will say the way they sit with an undilated pupil, makes the eyes seem slightly unevenly balanced, but it is difficult to tell in the mirror and no one has commented on it. Doesn't get dirty easily. Looks natural. I have been using this product for many years. From all off the colour contact brands this is looks the most natural. ColourVUE 3 Tones (2 lenses) – dioptric. 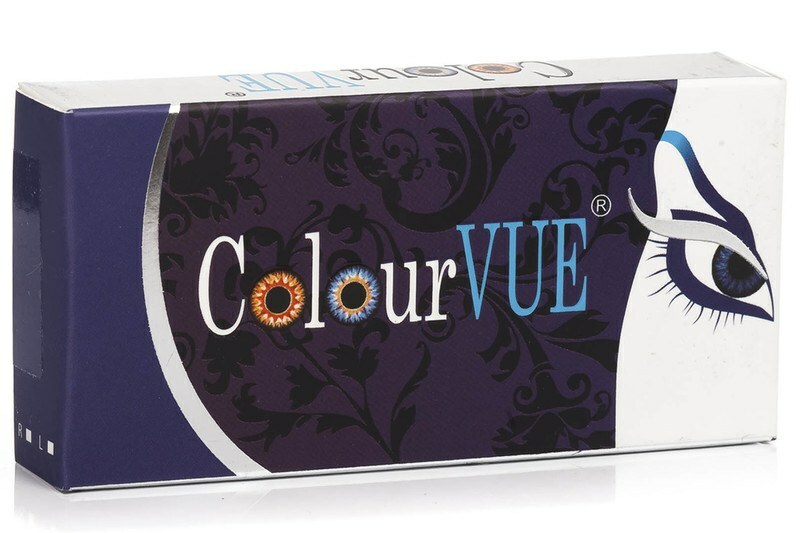 ColourVUE 3 Tones is a popular range of coloured opaque hydrogel contact lenses that give a natural look. Made from newly developed skin-like material that prevents corneal damage, and with excellent oxygen permeability, these sight-correcting lenses are remarkably comfortable. 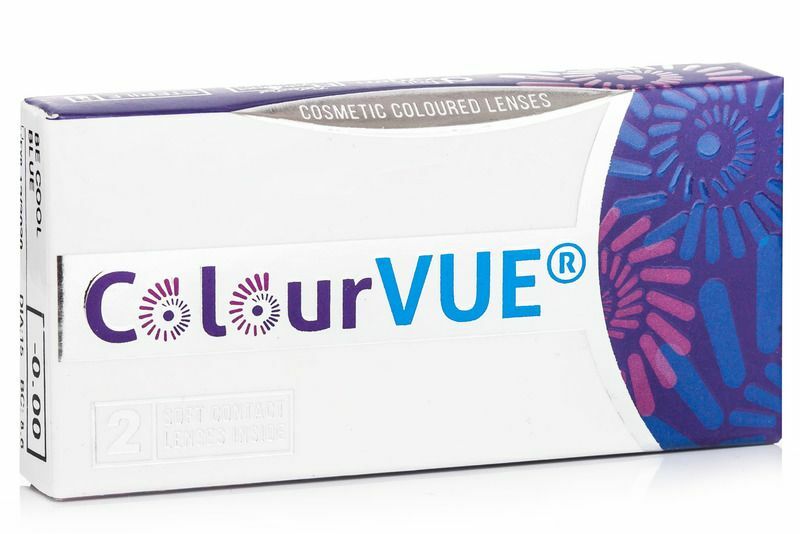 ColourVUE 3 Tones are suitable for a daily use and should be replaced every three months. These are quarterly lenses and should be replaced every 3 months. Do you have these coloured contacts for cosmetic use only as I do not need them for sight correction. Yes, you can select the “0” PWR in the menu. Hey, when ordering this it says right eye and left eye, but 1 box contains 2 lenses. Am I buying 1 box of 2 lenses for my right eye alone? Or is the 1 box for my right and left eye? can you let me know more about these lenses ? I dont really understand it . these lenses can last up to 3 months. but 1 box has 2 lenses for 1 eye. So 1 lens I can wear it about 1 and half month ? or when I feel it not good anymore n I will replace the second lens ? Thank you for this question. Each lens can be used up to 3 months, if well cleaned and stored, in fresh solution. Usually, the eye care specialist who issued your prescription, should provide other specific recommendations, since not all the eyes are the same. I hope my reply helped. Happy to remain at your service. hey will these make a difference to my natural brown eye colour? and are these daily disposable or ca you wear them every day and for how long? also will bc 8.6 make a difference because my bc is 8.4? These lenses should make a difference to your eye colour but I am afraid that we cannot guarantee it because it depends on the actual colour tone of your iris. Still, these lenses are often used to emphasize the natural colour rather than to change it completely. I find that the green ones are better for brown eyes, compared to the blue ones, when opting for a colour change. These lenses are worn during the day and removed and stored in fresh solution. If maintained well, they can last up to 3 months. As about the base curve, please ensure that you only order lenses with the parameters prescribed to you by your eye specialist. The base curve 8.6 could be a bit too big for you. Kindly ensure that you have a prescription for the lenses you would like to order. I hope my reply answered your queries. I will be happy to assist you again. Hi, i am wearing regular sight correction lenses on bc 8.4 dia14.0 ! Those colour ones are the only ones close to my size as they are dia 14.0 ( when all other colour lenses are 14.2 or 14.5) but bc 8.6! Do you think they will fit ? Thank you so much for your comment. If you have a BC 8.40 and these lenses have 8.60, you may feel the difference or not. It depends on every person. I have tried by myself different BC and I do not feel the difference, but maybe if you try them on, you can feel something. The one who can reply to this question 100% sure is your optician. I hope my answer helped. What does power mean? I don't know which setting to pick? This indicates the amount of lens power, measured in diopters (D), prescribed to correct nearsightedness or farsightedness. If you need further help, feel free to send us an email at info@lentiamo.co.uk or using the contact form. I have been using these lenses for 2 months and as I said in my original post, I am happy with them. But the past 2 days they have started to hurt my eyes. I wore them for only 2 hours today and had to take them out because they made my eyes red and painful even after I took them out. I checked the leaflet on the box I bought them in and it says that they are recommended for only 1 month, not 3... Are u sure that they are for three months and not 1? I'll still be buying them again but I think you may need to check the leaflet inside the box? Thank you! I am so sorry that you are having this kind of problem with your eyes and the lenses, this has never happend before. Please also make sure that you change the solution you store them regularly and the case that you store them needs to be replaced every 3 months as well. As stated from the manufacturer and their official website, these are to be replaced every 3 months. Could you please email me a photo of the leaflet at info@lentiamo.co.uk ? Once again, i am so sorry about this. Yes, please make sure that you change your case as well. I would be more than happy to further check them. If you could send me a photo of the box, the lot number written on the box and the leaflet, I could contact the supplier about your case to see if there is something wrong. Please accept my apology, I searched the house and found the box and leaflet to send it to you and realised I read the leaflet wrong! The 30 suggested replacement was for CLEAR lenses not the coloured ones. I just received my new ones today and will be extra careful with them to make them last. Sorry again! I thought dioptric meant they were for astigmatism, Long sighted and short sighted?do u currently have any coloured lenses for people who suffer with astigmatism? Thank you so much for your comment. Unfortunately, coloured lenses for astigmatism does not exist at the moment. There are only for myopia or hyperopia. Sorry for this inconvenience. If you have more questions, do not hesitate to contact us. These lenses are not suitable for the correciton of astigmatism. I just received my colourvue 3 tones in grey today and to be honest because they were so cheap I didn't expect to be impressed by them too much... But I was very pleasantly surprised! They are comfortable and the colour is very natural looking on my medium-dark brown eyes. There isn't an obvious difference when I'm in the house unless I'm sat next to a window but as soon as I go outside, no matter the weather there is definitely a visible difference in eye colour and it looks natural aswell. I've tried other makes like Air OPTIX colours and Expressions by Coopervision but these Colourvue are more natural than them. And the best thing is that they are cheaper and last longer than other makes as they only need replacing every 3 months. Of course I've only worn them a day but first impressions are great! They have quite a large itis hole in the middle which fits my eyes great and reduces shadows in my vision which can sometimes occur with colour contacts. Will defo order again. Thank you so much for your comment. We are deeply happy because you like the lenses. We hope you really enjoy them. Will the grey or brown colour show on black eyes? Hi. It always depends on the natural shade of your eyes. However, we believe that the grey and brown lenses are less likely to be very visible on black eyes. Grey ones may make your eyes a shade lighter. Brown eyes will give your eyes a brown hint. For immediate replies, please call us on our toll-free number between 7:00 and 15:00, Mon – Fri, at 800 249 4219. Hello. Would they work for dark eyes? Hi, I personally have darker eye colour and they do work with me. However, the final result strongly depends on your actual colour. Hello, Thank you for your comment. We are glad you found the lenses comfortable although they did not change the colour of your eyes much. These have very natural look. Hi, do these come with solution? Hello, These lenses come on their own. The solution has to be purchased separately. Hi. Do you accomodate for this? I am sorry to inform you that at this moment there are no coloured toric lenses. Dioptric lenses are contact lenses with a prescription – for users who are shortsighted, longsighted or with an astigmatism. Non dioptric lenses are cosmetic and are used for enhancing and changing the natural colour of your eyes. Hello, these lenses are for 90 days. Choose your prescription and colour and add them to the basket, then proceed to checkout. We do not require a copy of prescription. If you need just cosmetic lenses, look up ColourVue 3 Tones – non-dioptric.